Team Scott-SRAM MTB-Racing won the Prologue of the 2019 Absa Cape Epic on the slopes of Table Mountain ahead of Cannondale Factory Racing and KROSS-SPUR on Sunday 17 March. Cross country specialists, Nino Schurter and Lars Forster finished in a time of 00:43:41.5, some 41 seconds ahead of Manuel Fumic and Henrique Avancini to claim the Yellow Leader’s Jersey. Conditions on the day were cloudy and cool with some rain early on, making for fast racing (the winning time was two minutes faster than in 2018) but also producing a few bumps, bruises and upsets. “The course suited us quite well,” commented 32-year-old Schurter, who won the 2017 Absa Cape Epic with Matthias Stirnemann. The multiple World and World Cup champion is racing with Swiss compatriot and Absa Cape Epic debutant, Lars Forster, this year. “We are cross country racers and this is our strength, so we are very happy with the win,” he said. Forster, who was announced only last week as Schurter’s partner after Andri Frischknecht took ill with a stomach bug, was equally pleased with the result. Forster then lead Schurter down the Land Rover Technical Terrain section on the infamous Plum Pudding. At this point the pair had a lead of around 12 seconds, a gap they had already built up at the second time check on the 20-kilometre route, which featured some 600 metres of climbing. For most of the five time checks, they were followed closely by the South African SpecializedFoundationNAD pairing of Matt Beers and Alan Hatherly, before disaster struck less than two kilometres from the finish, in the form of a puncture. The setback saw them eventually finish fifth overall, behind Cannondale Factory, KROSS-SPUR and 7C CBZ WILIER. “Bit of a lapse of concentration there,” said Matt Beers afterward. “We were going super hard and I hit a rock. It was close to home so we decided to just nurse it home for the final two kays,” he said. “We stayed calm and limited our losses and are happy to wear the Absa African Red Jersey, all things considered,” he said. The popular Cannondale Factory pairing of Manuel Fumic and Henrique Avancini had a great day out, much to the delight of the local fans who lined the route, despite the unseasonably cold and wet weather. “We showed today that our form is in a good place and I am really happy how we went,” commented Henrique Avancini, who arrived in the country only this week, after some extensive travel delays. “We are in a good place for the rest of the week, let’s see how it all goes,” he said. Perhaps the biggest surprise of the day was the eighth place finish of the much-touted Investec-songo-Specialized pairing of defending champion Jaroslav Kulhavy and debutant, Sam Gaze. 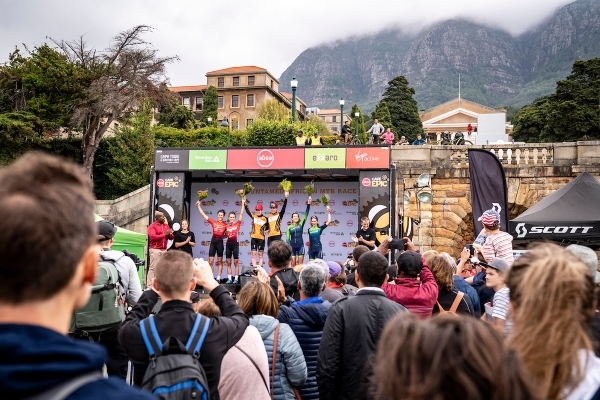 They are some two minutes back, time which could easily be made up on Monday’s Stage 1 over 111 kilometres on a challenging route around Hermanus. The stage features some 2700 metres of climbing and takes in some of the old icons of the Absa Cape Epic, including Rotary Drive, the La Vierge stairs and the Katkloof Climb, among others. The all-Swiss pairing of Scott-SRAM MTB-Racing won the 111km Stage 1 of the 2019 Absa Cape Epic in emphatic fashion on Monday 18 March.